There are many fancy doughnut shops in New York, but sometimes you just want a doughnut, no fuss, nothing complicated, just simple and sweet. Those are the kind of doughnuts you’ll find at The Donut Pub, a 24/7 doughnut shop operating on 14th Street since 1964. It’s the kind of doughnuts you imagine cops to eat, and in reality, they do. Two weeks ago, I saw two of New York’s Finest at The Donut Pub on a pick-up. I’m not sure which doughnuts they got, but here’s my top five. 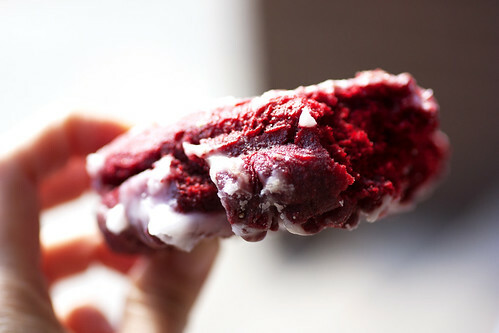 If you’re still not over the red velvet cupcake craze of 2007, try a red velvet donut ($1.15). If anything red velvet annoys you, order it anyway and just close your eyes while you’re eating it. It’s basically a light chocolate cake doughnut with a crackly sugar glaze. Nothing wrong with that. Holes and minis also come in red velvet flavor. I like the holes because they’re a bit fluffier than the regular doughnuts. The holes are 3 for $1.40, but if you catch the older gentleman behind the counter on a good day, he’ll throw in an extra one for free. 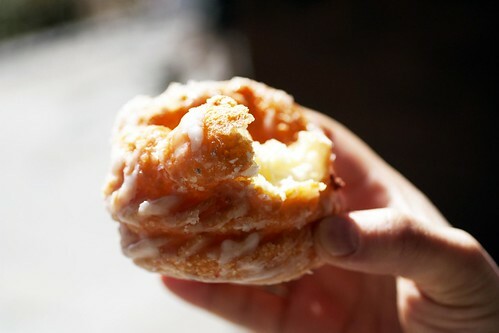 I also like the cream-filled yeast doughnuts at The Donut Pub. The outside is squishy and the smooth cream reminds me of the supermarket vanilla pudding I used to eat as a child. Again, nothing fancy at The Donut Pub. It’s all about nostalgia and sugar. 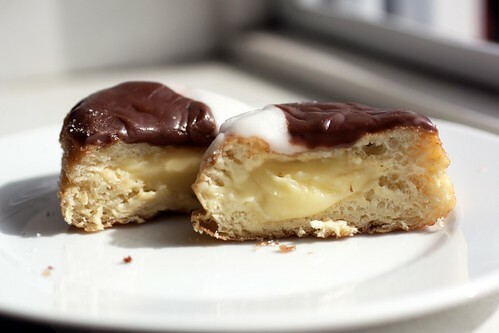 The cream is found in several of their doughnuts, but I like the black & white Boston creme ($1.15). Because sometimes, just one frosting isn’t enough. Also, the vanilla side balances out the intense sweetness of the chocolate. Speaking of sweet, I love the French cruller ($1.50) at The Donut Pub. 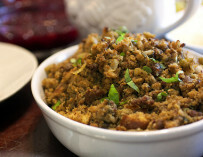 The twisted eggy dough is airy, tender but not too chewy, and the exterior is all sweet sugar glaze. It’s just about perfect. Jelly doughnuts are always my favorite though, and the ones at The Donut Pub are no exception. There’s nothing special about the jelly there. In fact, it’s lumpy and slightly artificial in taste (i’ve been told it’s raspberry jelly, but to me it just tastes red), but it’s sweet and satisfies your inner child. What I do really like is that they have regular sugar-coated jelly doughnuts. Some people like powder sugar, but I like the crunch of regular sugar on doughnuts. If you don’t, they have powder sugar doughnuts as well. 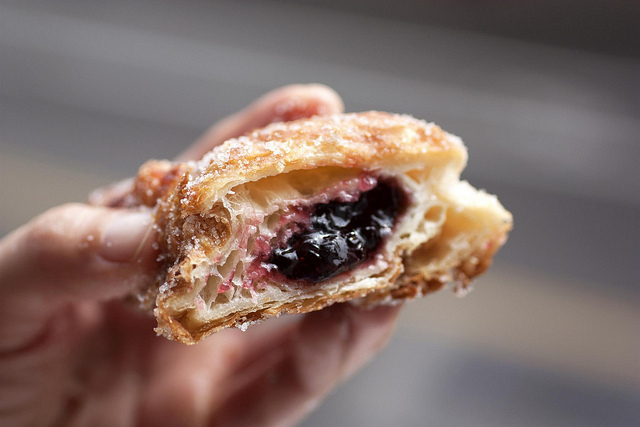 If you like sugar, jelly, and croissants, however, go there Saturday morning for the croissant doughnut ($2.25). 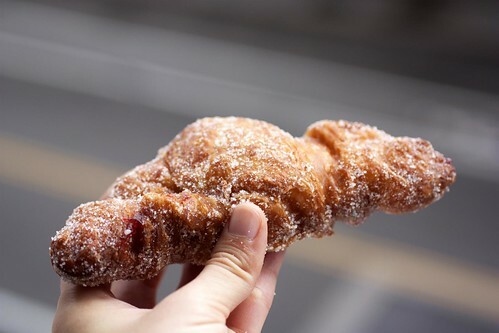 It’s a jelly-filled, sugar-coated doughnut shaped like a croissant with croissant-like layers. Not a million layers like a good croissant, but just enough. I especially like the slightly crisp ends. (Cream-filled is also available.) It’s amazingly good, but alas, they only make a dozen every Saturday. Get there early, or at least early enough to beat me. I’ve been there two Saturdays in a row. 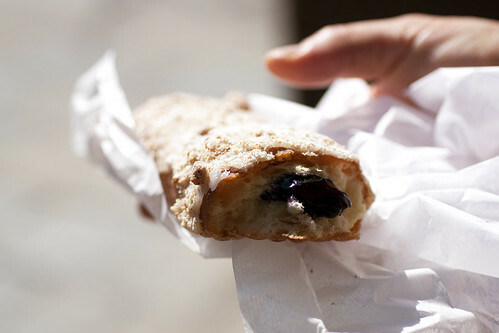 If you want better fruit filling, opt for the blueberry crumb cruller ($2.25), a glazed, streusel-topped, doughnut stick filled with blue filling that actually tastes like blueberries. I’d prefer if the streusel topping was crunchier, but in general, you can’t be too picky at The Donut Pub. It’s not one of those places. It’s a place you go to simply eat and enjoy. Forty-seven years and counting. Woo! I love the Donut Pub 🙂 Swinging by for a handful of doughnuts holes is one of the happier parts of walking along 14th St.
Ohh la la! I love doughnuts. I’m happy that they’re slowly dominating the cupcake craze. 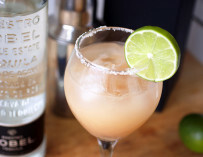 @Meister – Give it a shot. Sit at the counter, order a doughnut and a coffee. You’ll feel like you’re in old New York. 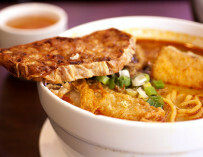 @James – Definitely one of the better spots on that street. @hungry – Cupcakes are OK, but I need variety. One can’t live on cupcakes alone. Now that you’ve tried Donut Pub, you must venture to Greenpoint and hit Peter Pan Donuts on Manhattan Avenue. Same old-school vibe, with lots of counter space, and both old-fashioned favorites (the marble crullers are great) and new creations (love the one filled with chocolate mousse). Nice list, I love the Donut Pub. Living halfway between Donut Pub and Doughnut Plant has been a nightmare for my diet! 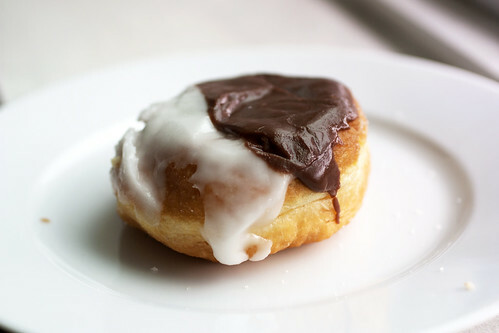 I do have to say, if you have never tried it, give the plain (ie, yellow cake) chocolate dipped donut a try. There is something about their chocolate that gives it a crunch you don’t get at other places. This also happens to be the ultimate coffee-dunking donut! Thanks for the list! I’d probably be frozen with indecision if not for this. Will definitely check it out. this be awesome. 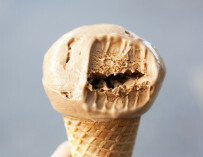 i like chocolate creme. their version is mighty good. gotta try the red velvet one next time though! @Stephanie – I have but haven’t posted yet cuz I’m still doing research! 😉 So far, really like their coconut cream. @BigB – I love recs! Keep them coming! @Danny – Yup, Donut Pub be awesome.